In order to check the randomness of numbers generated by a RNG (Random Number Generator), either pseudoRNG or trueRNG, is to use statistical tests such as those provided by the well known dieharder or NIST Test Suite. Nevertheless, human are also good at detecting patterns in graphics and therefore, it is also insteresting to use graph to check that these data are evenly distributed. 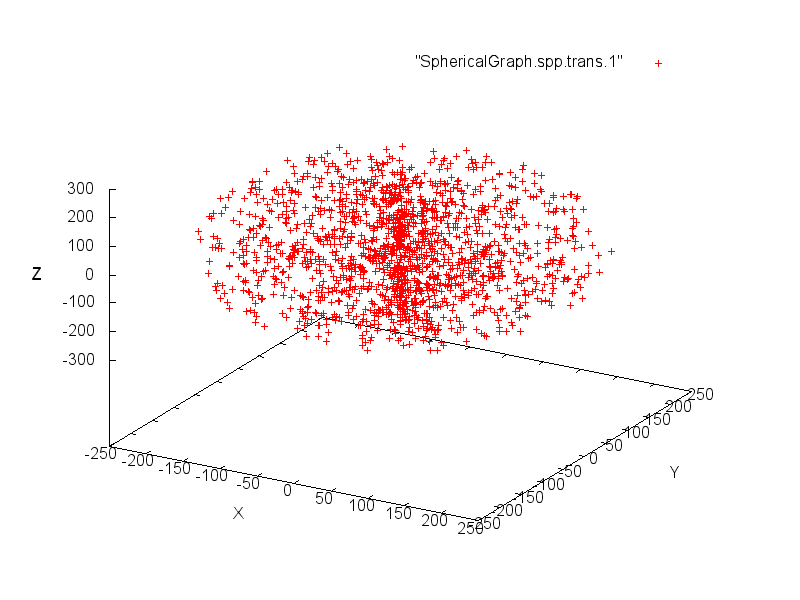 This document describes how to represent random numbers using 3 kinds of graphics: Cartesian coordinates (x,y,z), Polar coordinates (r,θ) and spherical coordinates (r,θ,φ). To keep a readable graph, you shouldn’t plot more than 3 000 plots (you can plot several graphs from the same RNG flow in order to plot more data). 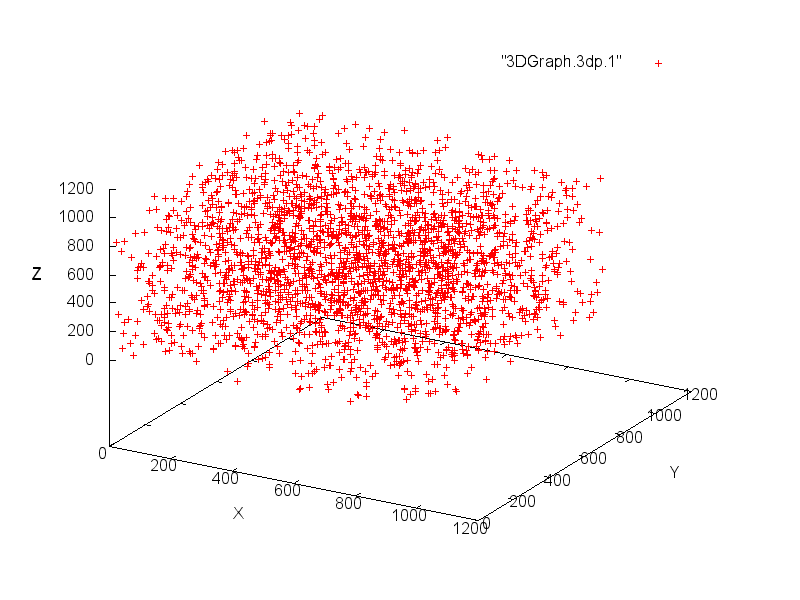 With this coordinate system, we must extract 3 coordinates (x, y, z) from the random numbers flow for each point to plot. 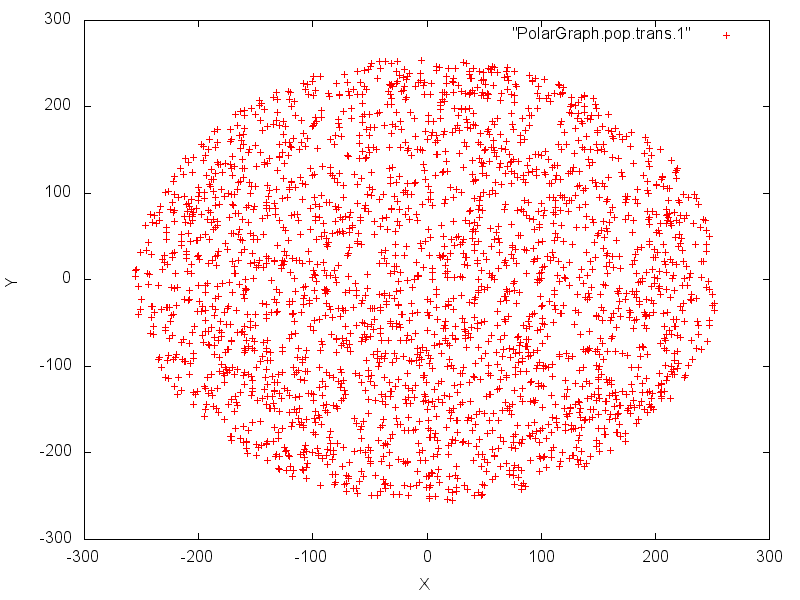 If we want to plot the graph in a range of [0,1024] for each coordinate, we have to extract 10 bits for each coordinate. To plot the result with gnuplot, we create a text file with one line for each point and each coordinate separated by a space. I’ve written a Java program in order to create the text file with the cartesian coordinates. You can download it there (source code). With this coordinate system, we must extract 2 coordinates (r,θ) from the random numbers flow for each point to plot. I’ve written a Java program in order to create the text file with the polar coordinates. With this coordinate system, we must extract 3 coordinates (r,θ,φ) from the random numbers flow for each point to plot. We extract 48 bits from the flow for each point and we use the 1st 16 bits block to compute r, the 2nd 16 bits block to compute θ and the 3rd 16 bits block to compute φ.
I’ve written a Java program in order to create the text file with the spherical coordinates. Copyright © 2019 IT Security Blog. Powered by WordPress. Theme: Ample by ThemeGrill.